In the aftermath of the fire that destroyed Whiskey Jacques' bar on Monday, a pile of charred timber lies in the southbound lane of Main Street, leaving two nearby buildings looking like disemboweled carcasses. The flames have been extinguished, the smoke has cleared and the chaos that consumed the town has disappeared, with an unusual stillness pervading the cordoned-off section of street. Excavators have pulled the burnt remains of Whiskey Jacques' away from the northern wall of its neighbor, the Sawtooth Club, creating open space that had long been filled by a line of historic Western buildings standing shoulder to shoulder, like the set of an early Clint Eastwood movie. Around town, the incident is talked about in hushed tones, as if a dear friend had passed, and city officials are hailing this as yet another difficult blow to absorb in the wake of last summer's Castle Rock Fire. But optimism has been found in an unlikely place, as Whiskey Jacques' owner, Karin Martin, has quickly proved to be a model of resiliency. According to Kristen Derrig, who has worked at Martin's establishment for over a decade, most recently as bar manager, Martin met with architects the day after the fire to begin drawing up designs for a new building, which she hopes can be constructed before the end of the year. Martin was scheduled to meet with her insurance adjuster on Wednesday, the result of which will likely determine how she proceeds. But she has left no doubt that she plans to rebuild not only in the same location, but in a similar style as the original building, which is estimated to be over a century old. "She wants to make some improvements and perhaps add a roof deck, but the look will be the same," Derrig said. Other improvements could include a small apartment on the second floor to house visiting bands and possible parking spaces for employees at the back of the building. Martin said that she briefly considered reopening Whiskey Jacques' at a temporary location, the former Williams Market being one of those under consideration, but that it wouldn't be worth going through the renovations necessary to make a space suitable for live music for just a short period. Her plans have been well received, not only by members of the public eager to have their favorite venue for live entertainment back, but also by city officials, who are ecstatic that Martin has no desire to build above the height of the Sawtooth Club. Sawtooth Club owner Tom Nickel said he hopes to be open by mid-December as well. He was also set to inspect the damage with the fire inspector and insurance adjuster on Wednesday, but could not be reached for comment by press time. Nickel's restaurant suffered significant smoke and water damage to the second floor, as firefighters were forced to punch holes in the northern wall and keep it soaked with water during the conflagration. As for Whiskey Jacques' neighbor to the north, the vacant building that most recently housed Dirty Little Roddy's, the future is less certain. This building, at 271 Main St., is owned by Ore House LLC and was destroyed. One of the managers of the company, Robert Kantor, said it was covered by insurance. According to the Ketchum Fire Department, the two buildings had a combined assessed value of $2.4 million, not including loss of income. Kantor said Richard Albright, owner of Rico's Pizza and Pasta, holds a lease on the property, but had, in turn, leased it to Boise bar owner Ted Challenger, who opened Dirty Little Roddy's at the site. The bar lasted only about a year before closing in March. Both Kantor and Albright declined to discuss details of the lease agreement, as the investigation is still ongoing. Kim Rogers, spokesperson for the Ketchum Fire Department, said the investigation is being carried out by State Fire Marshal Investigator Ivan Hibbert, with assistance from Ketchum Police Detective Scott Manning. She said the investigation is focused on the front portion of 271 Main St.
"The investigation is going slower than anticipated because of safety concerns," Ketchum Police Chief Corey Lyman said, noting that the front of the building, while still standing, is extremely unstable. Rogers said the investigation could take up to a week to complete, after which the front façade would be pulled down and the rubble cleared from the street. Once the rubble has been removed, the street will reopen. As of Thursday afternoon, all streets were open except for Main Street between Sun Valley Road and Second Street. The sidewalk on the east side of Main Street has reopened. Rogers said one piece of positive news that has come clear since the dust has settled is that the fire won't keep the city from holding its Nightmare on Main Street Halloween celebration, though the details have yet to be finalized. Monday morning's fire began at the vacant 271 Main St., a building that was noted for the seemingly ever-changing name above the front door. Most recently it was occupied by the bar and dance club Dirty Little Roddy's, the latest in a long line of food and drink establishments. The Tram Club, a popular watering hole in the 1950s and 1960s, was remodeled by Ketchum legend "Captain Jim" Harris into the Camp Robber, which in turn gave way to Mulvaney's, a tavern remembered fondly by some of the long-tenured residents. Other ventures that failed to endure for one reason or another include Country's, Silver Creek Saloon, Grizzly Bear Pizza Parlor, Glory Hole Mining Company, X's Trough ad Brew, and Baldy's Bistro. 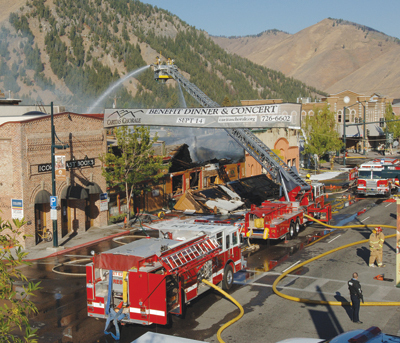 More residents remember the building's incarnation as the Ore House, a bar and restaurant originally located in Sun Valley, and the Ketchum Kantina, a Mexican restaurant owned by Richard "Rico" Albright, owner of Rico's Pizza and Pasta on the opposite side of Main Street. The amount of turnover in the building has led to more than one conversation among locals about the possibility of an ongoing curse, talk that is not likely to subside in the wake of the fire.